Congratulations to Jennifer and Richard. 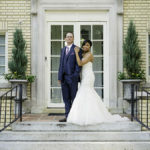 They got married at the beautiful Separk Mansion located in Gastonia, North Carolina over the weekend. I’ll be sharing more photos from their wedding soon.